Messier 83 is one of the closest spiral galaxies in the night sky, located just 12 million light-years from Earth. Its unique properties have earned it two of the more evocative galactic nicknames: the Southern Pinwheel and the Thousand-Ruby Galaxy. 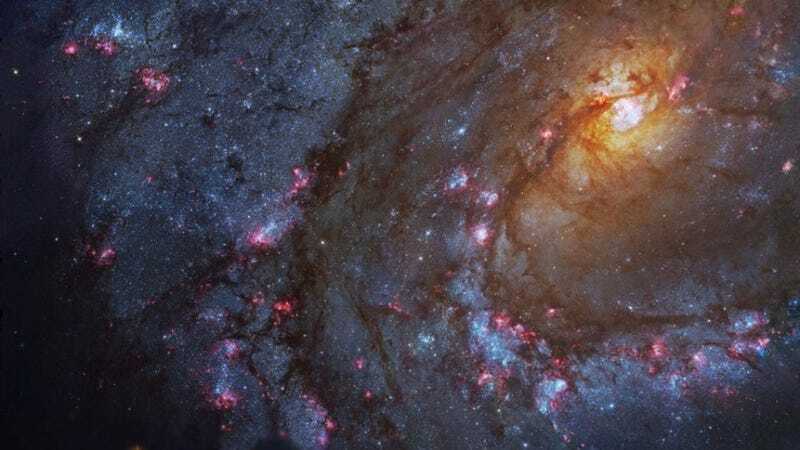 Typically found near the edges of the thick dust lanes, a wealth of reddish star forming regions also suggest another popular moniker for M83, The Thousand-Ruby Galaxy. Dominated by light from older stars, the bright yellowish core of M83 lies at the upper right. The core is also bright at x-ray energies that reveal a high concentration of neutron stars and black holes left from an intense burst of star formation. In fact, M83 is a member of a group of galaxies that includes active galaxy Centaurus A. The close-up field of view spans over 25,000 light-years at the estimated distance of M83. The Hubble Legacy Archive via NASA.